Using a screwdriver is easy - who needs a page like this? True - you will often get away with using the wrong screwdriver or not using it properly, but you can easily damage the head, making it extremely difficult to remove an obstinate screw. 2 Which way to turn it? Of course, you will first of all need to know which way to turn a screwdriver (and how to remember, until it becomes second nature). But the choice of screwdriver is important (there are half a dozen fairly common types), and just as important is how you use it. Screwdrivers have pointy ends and although not sharp like a knife, they can still cause serious injury if they slip or are misused. Which way to turn it? Those who are unaccustomed to using a screwdriver are often uncertain which way to turn it. You turn a tap anticlockwise to open it and release the flow of water. You turn a screw anticlockwise to undo it and release whatever it's holding. You turn a tap clockwise to turn it off and hold the water supply. You turn a screw clockwise to tighten it and hold whatever it's fixing. The key thing is not to let the screwdriver slip. If it does it's liable to damage the head, or "cam out", which will make it harder or even impossible to remove the screw. First of all, make sure you're using the right type and size of screwdriver (see next section), particularly if the screw might be tight. Make sure you're holding the screwdriver straight and not at an angle to the screw. Press hard! If you can't turn the screw easily, PRESS VERY HARD!! If the screwdriver slips, you're not pressing hard enough. But be aware of what might be taking the strain underneath the screw. If the screw is rusty you may be able to loosen it by applying a little penetrating oil to the thread and leaving it to soak in. If a screw really, really doesn't want to shift, ask yourself a silly question: were you turning it the right way? Of course you know that you turn a screw anticlockwise to undo it - you're not stupid. But just occasionally you'll find a left handed screw which turns the other way, most usually on a rotating shaft where the direction of rotation might otherwise cause the screw to come loose. A screw on the end of the shaft of an electric motor holding a fan, an impeller or a pulley might have a left handed thread for this reason. When inserting a screw it's very important to make sure it's straight otherwise you can get a "crossed thread" which will damage the screw or the threaded hole, or both. If you have any difficulty at all in getting the screw to engage with the thread of the hole, first of all turn it anticlockwise (as if undoing it) whilst pressing gently. You should feel a little click as the first thread of the screw engages with the first thread of the hole. Immediately start turning it clockwise to tighten it. You can practice this on a jam jar, or any kind of container with a screw top. People often put the lid on crooked so that the screw thread doesn't engage properly and the container doesn't seal. Turn the lid anticlockwise until you feel the click, then tighten it as normal and you should find it goes on straight. A screw should be well tightened, but never so much that the screwdriver slips and damages the screw head. If you're sure the thread has engaged properly but it's still very stiff, lubricate it with just a smear of Vaseline or silicone grease or soap. There are many different types of screw head but just a few common ones, and each comes in a range of sizes. With some types the wrong size won't work at all, and with the more forgiving types the wrong size will at best give you sub-optimal leverage and at worst will damage the screw head. The following are the types of screw you are most likely to come across. The commonest and oldest type of screw head just consists of a slot, and is driven by a flat bladed screwdriver. It has the disadvantage that the head is easily damaged and the screwdriver blade easily slips out of one end or the other of the slot. Choose a screwdriver with a blade which best fits both the width and length of the slot and make sure it's centred within the slot. In a tamper-resistant version the slot is interrupted in the centre, making it impossible to use a standard flat screwdriver. This requires a special screwdriver with a slot in the centre of the blade. This version is quite often seen in domestic electrical and kitchenware items. This is a common form of cross-head screw, not to be confused with the Pozidriv (see below). Phillips screwdrivers come in sizes 000, 00, 0, 1, 2, 3 (in increasing order of size), sometimes prefixed with "PH", to distinguish them from Pozidriv. Always use the right size if possible. Superficially similar to a Phillips screw, a Pozidriv screw is distinguished by the tick marks at 45 degrees and is designed to allow greater torque to be applied without risk of camming out. Pozidriv screwdrivers come in sizes 0 - 5, prefixed with "PZ". A Pozidriv screwdriver has a less pointed tip than a Phillips and so it is inadvisable to use a Phillips screwdriver on Pozidriv screws as the screw head is liable to be damaged if more than minimal torque is applied. Common in electronic equipment, a Torx screw requires exactly the right screwdriver. Correctly used, it gives very good resistance to cam-out without having to press excessively hard. Torx screwdrivers come in a wide range of sizes, from T1 (smallest) up to T100. The smaller sizes from around T6 to T10 are commonest in electronic repair. A tamper-resistant version has a small pin in the centre of the recess, requiring a screwdriver with a corresponding hole in the centre of the tip. These have a hexagonal recess in the head and require either a hexagonal screwdriver or an Allen key, which is simply a piece of hexagonal hardened steel bent into an L-shape. Self-assembly furniture and other items often uses hex screws and come with an Allen key in the pack of screws. Several unusual triangular screw heads have been invented but this one is sometimes seen on electronic and domestic electrical equipment where it is used to discourage dismantling by unqualified people, particularly where there might be a serious electric shock hazard. At first glance resembling a Torx screw, these have 5 lobes instead of 6. They are commonly used by Apple as a tamper-resistant screw, but the screwdrivers are readily available. If you order a replacement iPhone battery or screen it will often come with a cheap pentalobe screwdriver. Due to their small size, these can be fairly easily damaged. In addition to the above, less often you may come across various other types of screw. Many are listed in the Wikipedia article List of screw drives. 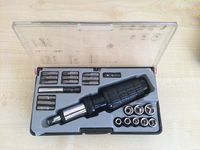 Many people will have an odd screwdriver or two in a kitchen draw, but a reasonably good set is almost essential for even the simplest repair tasks. However many screwdrivers you have, from time to time you may find you haven't got the right one for the job. But a well chosen selection will satisfy nearly all your needs. There are several options. You can buy single screwdrivers individually or in a set, and a set containing 2 or 3 each of flat bladed, Phillips and Posidriv would make an excellent start. If they come in a box to keep them together then so much the better. For more delicate work you will need some smaller screwdrivers such as jeweller's screwdrivers, however, these tend not to allow a good grip for undoing a tight screw without slipping. Single screwdrivers have reasonably long shafts allowing them to reach recessed screws easily. A screwdriver set with separate 6mm bits. Many people favour a screwdriver set containing a single handle and a range of bits. Since the handle is the bulky part this allows you to be prepared for a wide range of screw types with a single compact set in a box. Choose a set with a comfortable handle allowing a good grip. Many have a useful ratchet action that you can set to clockwise or anticlockwise. A set of security screwdriver bits. Most of these take standard 6mm hex bits, and sets of additional bits are available for unusual and security screws. 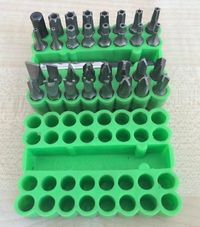 A set of long screwdriver bits. A disadvantage is that the standard bits are very short, which can make it difficult to reach recessed screws. But you can also get sets of extra long bits. In addition to the sets taking 6mm bits you can get precision screwdriver sets for working on smaller electronic equipment such as smartphones or cameras. These tend to be a much better option than jeweller's screwdrivers. If you're faced with a lot of screws or screws which screw in a long way, an electric screwdriver is a tempting option. These generally come with a set of 6mm bits which you can supplement as required. A disadvantage with the cheaper ones is that it makes it very easy to cam out a screw head since you have little control over the torque applied. Consequently you should only use it on screws which are fairly easily turned, and never on one you can't turn by hand. Also, if using it to insert screws you are probably better off leaving the last turn or two to do by hand. The more sophisticated electric screwdrivers have a slip clutch which limits the torque applied, but this needs to be set correctly, and it doesn't eliminate the risk of cam out and damage to the screw head if you don't press hard enough. This page was last edited on 1 February 2019, at 21:45.